If you’re looking to create a good atmosphere for gaming, it’s good to remember the soundscape as well. While we play Blood Bowl listening to hip hop or 80s hits, for Triton-4 I wanted something different. With the advent of this new-fangled, so-called “computer” and “internet” technology, the possibilities are starting to be pretty outstanding. So, using Spotify I created two different playlists. One is a collection of darkish, military themed soundtracks from such movies as Dog Soldiers, Aliens and Predator 2 as well as games like Crysis. Clocking in at 224 tracks and 13 hours, that’s enough scifi background music to last me a lifetime of gaming. In case I don’t all that drama, I can settle for a nice jungle ambience. Enter four hours of recorded nature sounds, and it’s like you’re hanging out somewhere tropic. For maximum effect you can actually play these two together. We manage it by having one player hook up their smartphone to some speakers and playing one list, and my PC blaring out the other. Don’t have Spotify? Click the logo below and get it. It’s the best thing that’s ever happened in the digital music distribution business. Have Spotify? Feel free to use the links below and use the playlists mentioned. I’d love to hear what you think of them, as well as what you listen to while gaming if anything. Triton-4 has kicked off nicely! 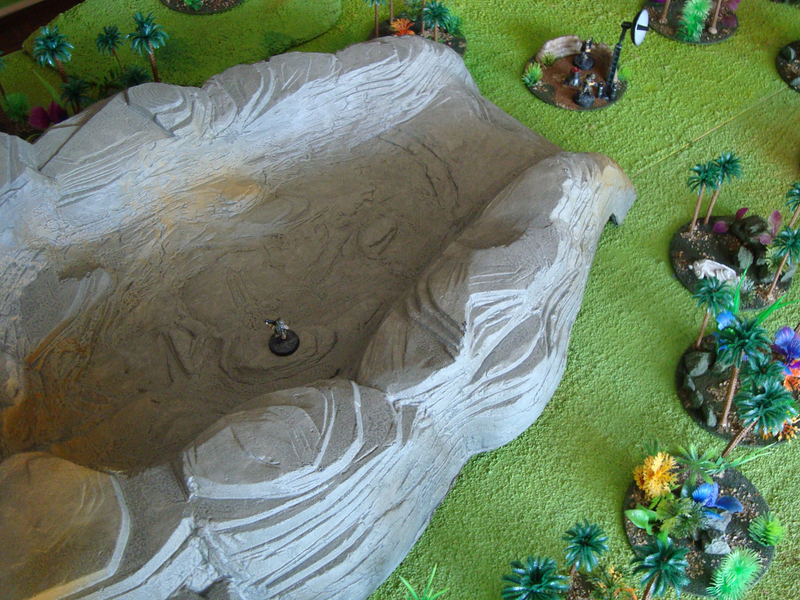 I’ve noted that the game provides both the motivation and the concrete incentive to do a lot of work on miniatures and terrain – so far we’ve played about a game per week, and that leaves me a week to finish whatever is needed for the next scenario or two. This weeks accomplishment was painting the three miniatures below – a pilot and a co-pilot/generic trooper from Woodbine, and a scientist from Hasslefree. All were used in a scenario detailed later on. I’m happy with how they turned out, and they were a joy to paint. This was a peculiar wargaming scenario in that there was a distinct possibility of there not being any fighting at all. The two marine squads (numbering five each) landed on the planet. Their mission was to investigate the jungle near the landing site and find a suitable location for a communications satellite, allowing the USS Hades to transfer supplies and personnel down to the planet. The marines went through the jungle in a fairly orderly fashion. A lot of strangeness was discovered, including dismembered animals, an abandoned camp site and a data recording device with unknown insignia. The only real action the marines got was when a weird flying creature attacked one of them. Some brutal hand to hand ensued, and finally Sgt. Kosltezlo was able to bring the creature down. 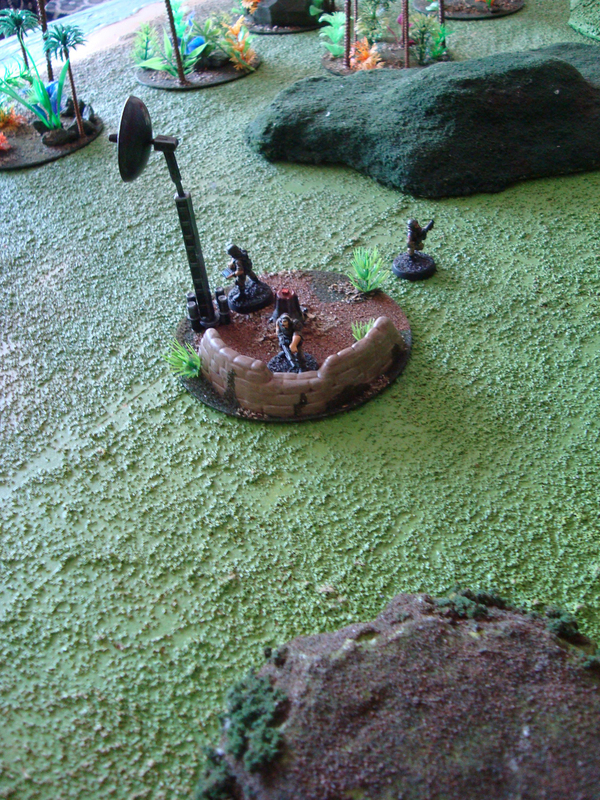 The marines then found a suitable spot for the comm station, and set it up. Below are a few satellite photos (disturbed by the atmosphere, naturally) of the proceedings. With the comm station in place, traffic from orbit was ready to start. Disaster struck soon, however, as a dropship carrying one of the lead scientists suffered an engine malfunction and crashed. The pilot, co-pilot and the scientist all survived, but were now stranded in the middle of the jungle. To make matters worse, military technicians had been able to decrypt some data from the recording device found earlier, revealing a xenomorph presence on the planet. With most marines stuck fortifying and building the base, Sgt. Kosltezlo took three marines with him to find the missing people. Xenomorphs were indeed present, and the crash survivors were quickly running and fighting for their lives. 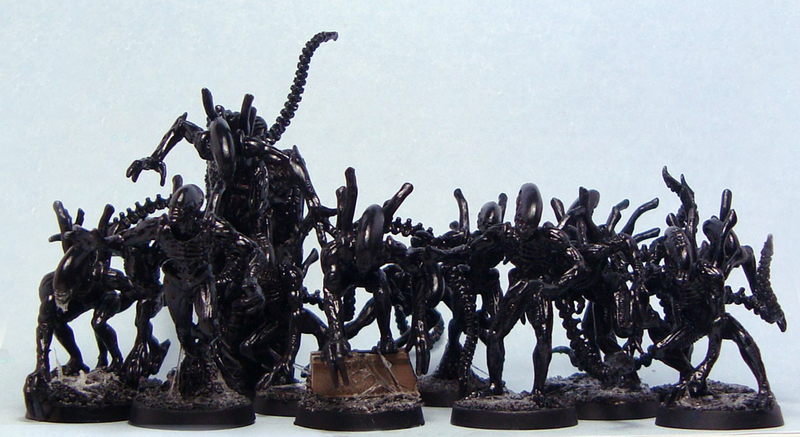 To make matters worse, most shots fired attracted more and more xenomorphs. The situation seemed desperate, with the rescue team quickly finding themselves in a serious fight instead of a search and rescue mission. The co-pilot was speared by a xenomorph’s tail, causing the pilot to panic and blindly run into the jungle. The scientist was manhandled from one marine to the other, and eventually the rescue team managed to drag him back to the camp, with the camp’s sentry guns chasing away any Aliens that tried to cross the treeline. While the mission was a success, the xenomorph threat was confirmed and their deadliness apparent. Following the daring rescue, the marines decided to go on another recon mission. While most xenomorphs had retreated deeper into the jungle, some remained. The marines advanced carefully towards the treeline, where they could glimpse flitting dark shapes. All of a sudden a rapidly moving Alien managed to circle around them and pounced on the target it perceived the weakest – Pvt. Turner who was still a rookie, only just having joined the force. 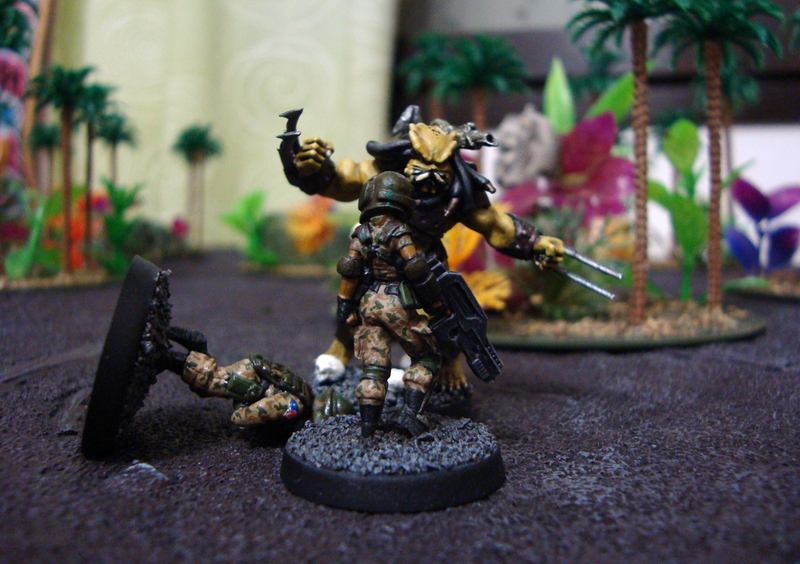 Turner was quickly joined by the other marines, and together the group of four managed to bring the creature down, with Turner himself delivering the killing blow. The youngster’s joy was short-lived, though, as acid blood sprayed from the broken body, showering Pvt. Turner and providing him with an agonizing death. The sight caused a ripple of horror, with Pvt. Glory escaping all the way back to base and the marines generally falling back. This prompted more xenomorphs to charge from the trees. The other squad’s leader, Sgt. Slaughter (I assume that’s a nickname) surprised everyone by downing xenomorphs left and right. 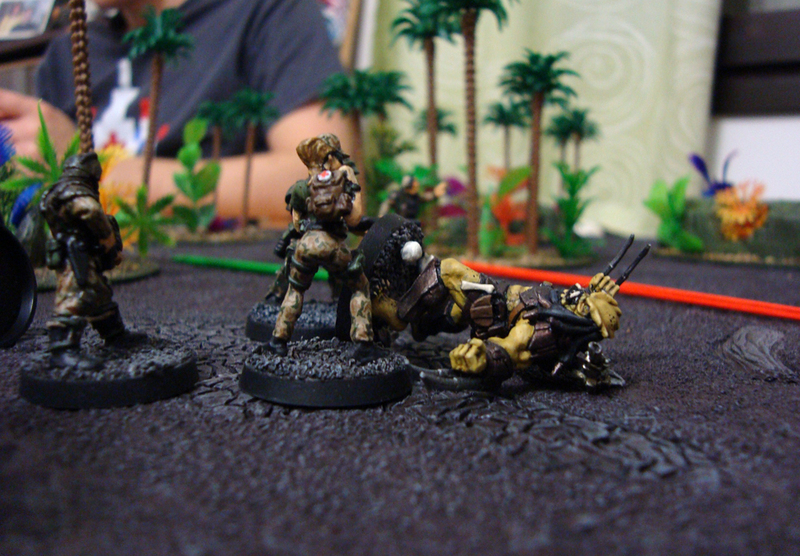 With his squad falling back around him, he took on first one creature, then another, surviving both and killing one. Other marines then moved up to help with the mop-up. 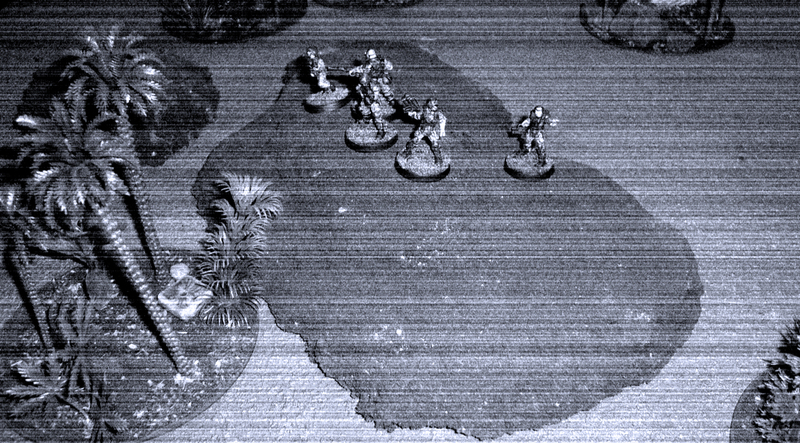 With most of the xenomorphs downed, the marines set their sights on the treeline to put down the one remaining beast. The Aliens’ speed proved to be incredible once again, as the creature flitted through the trees to charge another bewildered rookie, Pvt. Austin. The soldier tried desperately to escape, but the xenomorph mercilessly cut him down before being gunned to pieces. 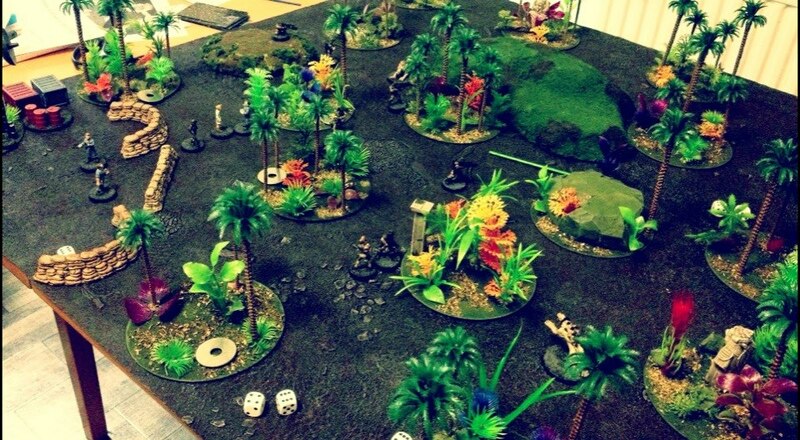 With the Alien threat neutralized, the marines finally managed to venture into the jungle. Their search brought up all sorts of interesting things, such as alien artifacts and xenomorph eggs. Pvt. Stanton from the first squad managed to evade a strange attack – all of a sudden three red dots appeared, followed by an explosive blast. Of the attacker there was no sight, but it was apparent that the xenomorphs weren’t the only threat around. On a more positive note, the pilot who had fled earlier staggered out of the jungle, bloody and incoherent. He was taken back to base by Cpl. Burbank. It’s anyone’s guess how he made it out alive. Most of the area had already been searched, when the marines made the same mistake as the dwarves in Moria: they dug too deep. 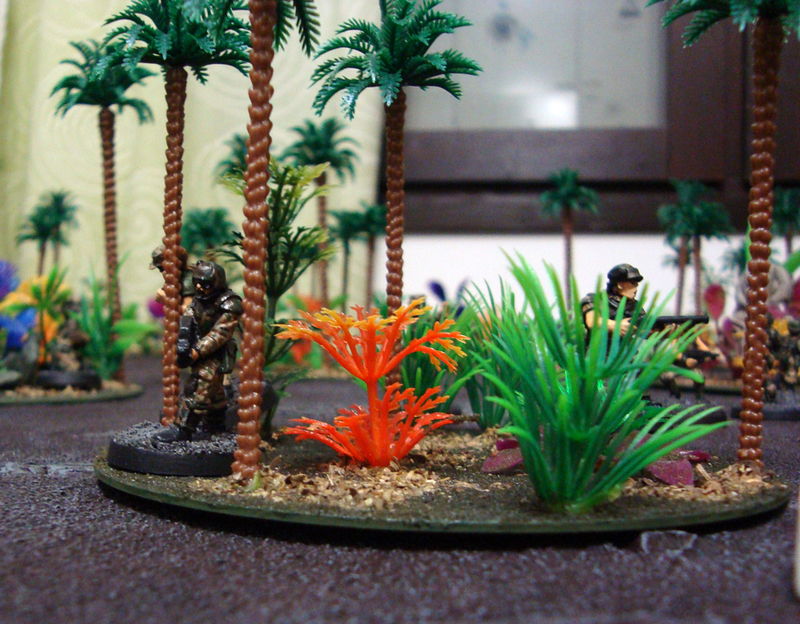 With the marines spread out through the jungle, Pvt. Stanton suddenly found himself surrounded by no less than six Aliens, four of which tore him to pieces. The marines retaliated fiercely after this first casualty, and managed to completely eliminate the creatures in short order, with Sgt. Slaughter even destroying one in close combat. Pvt. Gunn’s flame unit was also invaluable, torching jungle and xenomorph alike. After this the exhausted marines retreated back to their camp. The games were good fun, and we’re still getting to grips with all the rules. It’s getting quicker and smoother to play, and we’re slowly getting into the intricacies of the system. The narrative aspect is present, and we tend to view in-game events through a narrative filter. The second scenario especially was very cinematic and tense! With these three games the campaign is off to a good start, and both me and the two players are looking forward to our next session on next Wednesday. Whatever’s coming up next, the marines are in for a rough time with three of the original ten troopers down. By the way, feel free to comment on the satellite photo look of the pictures. In my opinion action report pictures are often quite boring, as they’re basically just miniatures standing next to each other. I figured I’d simply use them as for a bit of flavour, so photoshopped them heavily. Personally I like the look, but CC is definitely welcome! I’m not in a competitive frame of mind. Instead of miniature gaming, I’ve been wanting to get a role-playing game going. Building an actual RPG scenario, let alone a campaign is far too much work. 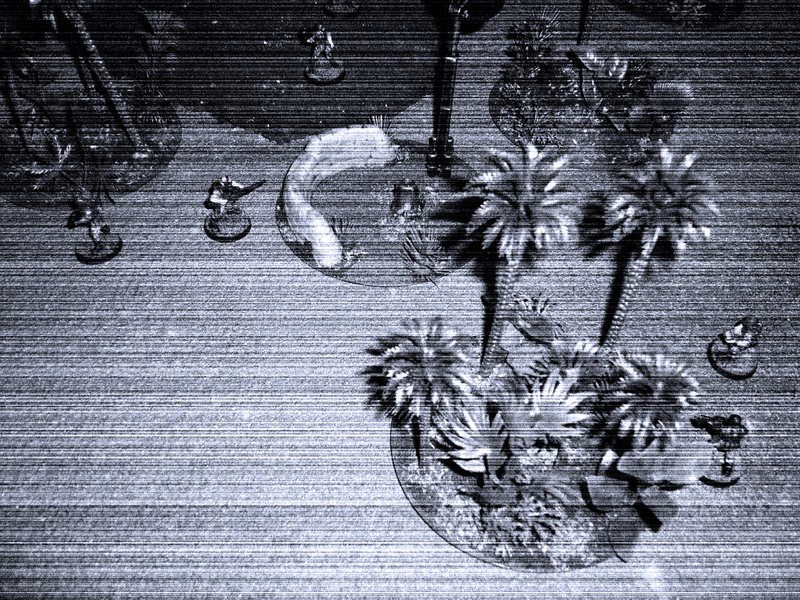 My problems were insta-solved, however, when I had the idea to combine miniatures with a bit of light role-playing. Of course this is just on a conceptual level currently, but I believe it will work. I’ve talked about adding narrative to wargaming before, and even posted a werewolf game report featuring such a union. I wanted to try a similar approach, but make it a bit more involved: a full campaign instead of a few scenarios, experience and skill development, named characters, things like that. And so Triton-4 was born. Triton-4 will be a small warpg campaign detailing the efforts of a Colonial Marine force to establish a foothold on the planet Triton-4. T-4 is a jungle planet filled with all sorts of nastiness, so doubtless the CM will have their work cut out for them. The scenarios will feature a fairly strong narrative element to keep things interesting, and the whole thing will be an affair for two players and a game masters, the latter being yours truly. 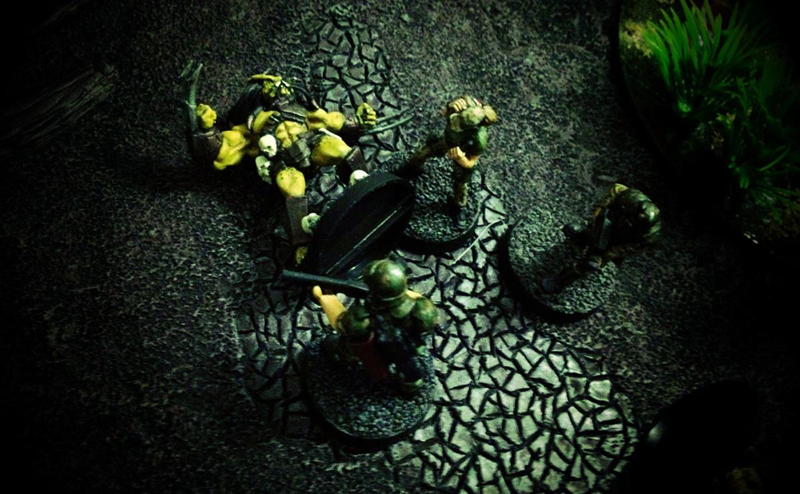 Two of my friends didn’t need much persuading to join up as well – they do a lot of co-op gaming on the PC and are into miniatures (at least 50% of them is) and RPGs. There are loads of good sides to a project like this. First and foremost it is a great source of inspiration. 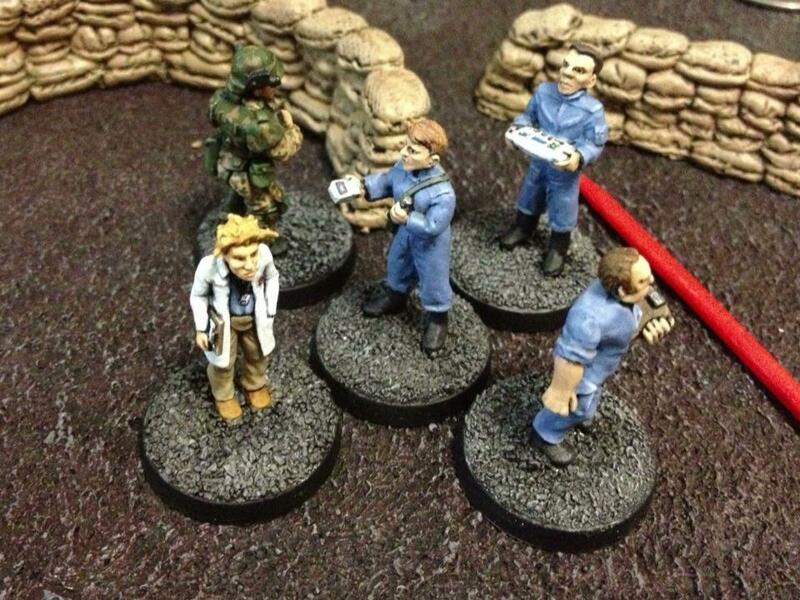 I have loads of stuff to do: tons of Colonial Marines to paint and plenty of terrain to finish. 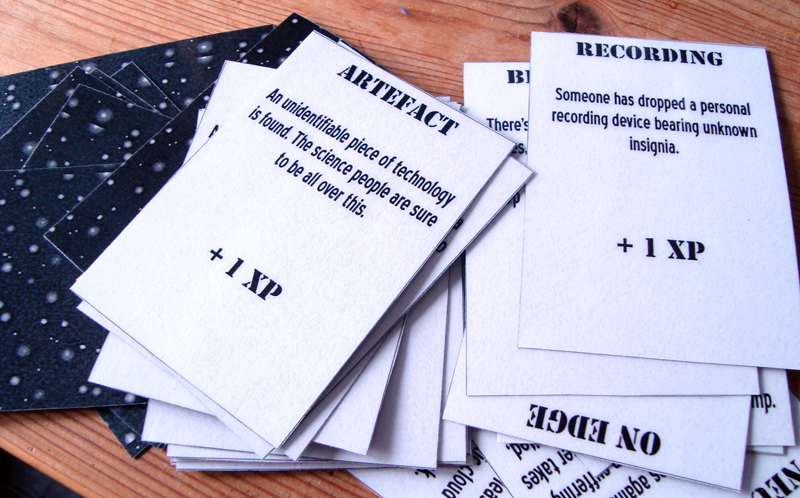 I also used the printer and laminating device at work, and made some exploration cards to be used in scenarios – see below. In case you’re wondering why a group of three Finnish gamers is using English cards, it’s simply because I figured I’d share the cards with interested parties later on. Secondly it’s been a great excuse to spend some more money. I have a bunch of bits, like crates, barrels and containers, coming in from Ainsty. They will be used to make a base camp for the CMs to venture out from. I also happened to spot a 40% sale at Victory Force Miniatures and picked up a bunch of their not-Star Trek spacefarers, who are generic enough to be used as civilian/scientist types. For the game system I picked Ganesha Games’ Flying Lead. FL uses the Song of Blades and Heroes mechanics, which make for a quick, intuitive game. The same basic mechanics are used in Fear and Faith, the system I used in gaming the werewolf game linked to above. A third, important thing is that a narrative campaign is not really a competitive affair. The players are co-operating, and just like in a RPG, the focus is mostly on creating a fun, interesting story instead of fighting tooth and nail for absolute victory. I’ve already told the players that the scenarios will not always be fair. It might be a scientist and a single Marine against a jungle full of wild beasts, for example. There are always reinforcements available, the main competitive aspects are going to be things like keeping your more experienced troopers alive and trying to complete scenarios successfully to maybe gain rewards or an edge later on. Just like in RPGs the scenarios will need to be challenging. Not impossible, not too easy. There are plenty of victory conditions available to choose from. The hypothetical scientist/Marine pair might have an objective to survive a set number of rounds, or to reach a communication uplink or whatever. As both of my victims players are experienced RP gamers, the idea will not be hard to sell. This should bring to the table the most important thing in gaming for me: fun. 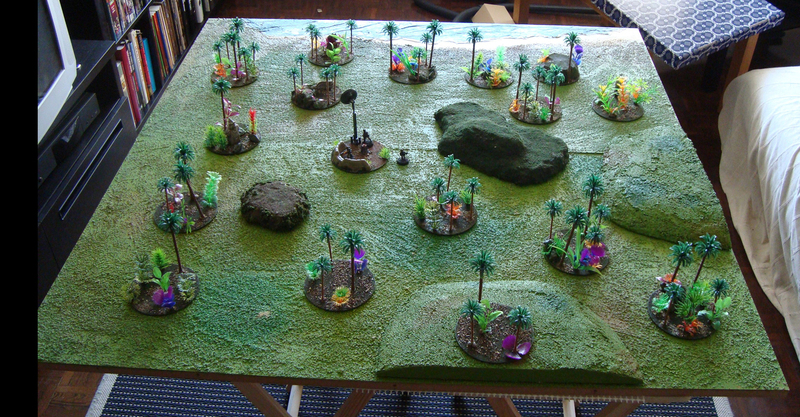 I’ll be chronicling the campaign as it progresses, as well as associated terrain building and miniature painting. Hopefully that will also increase my commitment to the project, as I have a terrible tendency to not finish miniature gaming projects that I’ve started. You are currently browsing the archives for the Triton-4 category.